It’s 7 o’clock on Friday night, and you know it: that shivering rush of excitation is holding steady as you ready for the night to take you wherever it wants to go. And then you’re gone out the door, on your way, the anticipation fades a little as your thoughts drag slowly to what you’ve left behind: a bad day at work, make that a month; broken fridge, you can think about eating later. Tonight is about one thing and you’re determined to ring enjoyment out of every goddamn minute, no ulterior motives, and no agenda: tonight you just want to lose yourself. Familiar feeling? I thought so, and Magnetic Man thought so too. Three of the godfathers of the dubstep scene: Benga, Skream and Artwork have collaborated to produce the album that hopes to take the sound of South London and make it the mainstay of anyone and everyone’s evening entertainment. A big ask, yes, but if anyone can do it, it’s these guys. They hold claim to two of the sub-genre’s defining break-out anthems: Benga and Coki’s utterly indomitable Night and Skream’s gorgeous Midnight Request Line. Born out of the remains of the collapsing garage scene and built on the remnants of 2 step at the end of the last century, dubstep has threatened to go truly global for a few years now, and the influence these three seminal producers have had in nurturing it towards this happy crossroads cannot be underestimated. So as Magnetic Man is released in the United States there should be no misinterpretation of what this record is: it is populist; it is inclusive and has been made only to satiate that lusting escapism that drives the dance each and every night out – nothing else. And so back to that Friday feeling, that, I would like to think, is where it begins with Flying Into Tokyo, a classical intro of bubbling, unseated, only just contained anticipation all rolled into the proverbial calm before the storm, and, before you know it, the main event is upon us. Returning heroine of the urban scene, Ms Dynamite opens Fire with the liberating imperative “Set them free and let them fly tonight / Burn it down and get them high tonight.” With simple, revving low frequencies and hints at the Jamaican dub to which this is all so indebted, it is just the hybrid of old and new that this record is supposed to be about. Magnetic Man one, traditionalists nil – good start. First single I need air seeks to push the purists just a step further, adding clean vocals and trance themes in a justifiably breathless showing – it doesn’t nearly match the rugged energy of the opener, less successfully replacing that with rhythms and themes that are far more suggestive of a weak house track. Nevermind, we’ll move on. The Bug proves a mammoth character piece as it claims insidiously “I am the bug in the global community” amidst its slowed, rolling basslines that reflect a time when DJs sought deeper and lower in the quest for a more completely tangible frequency. In contrast Ping Pong relies on snares and shifting, energetic melodies, holding more in common with the ambient sounds that have become more widespread in recent years. 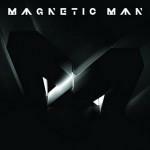 While Magnetic Man are clearly contented to cast their net wide, for example in making a more focused DnB track, Boiling Water, when all is said and done, this album showcases enough of what these guys do best. Karma Crazy in particular makes for one of the most interesting songs, mixing an elegant classical refrain against visceral undercurrents and tight, shifting bass. This album has failings and successes; it all adds up to a highly commendable record, there’s no doubt in that. However, what matters now is what happens next; unleashed on a global scale, where will it take the scene that spawned it?